The TS-1635AX is powered by a Marvell® ARMADA® 8040 ARMv8 Cortex-A72 64-bit quad-core 1.6 GHz processor that provides tremendous computing power and is capable of running a range of applications to help businesses grow as their data increases. 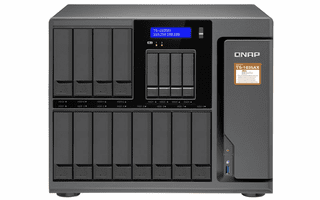 The TS-1635AX features twelve 3.5-inch drive bays, four 2.5-inch drive bays and two M.2 SATA slots for building a high-capacity and high-performance storage solution with optimal cost efficiency. The TS-1635AX is also equipped with two 10GbE SFP+ ports and two gigabit ports, providing high-speed connectivity and versatile networking possibilities. The TS-1635AX also allows hardware expansion with two PCI Express (PCIe) 3.0 slots, enabling more functionality by adding a QM2 M.2 SSD/10GbE card, QWA-AC2600 wireless network card and/or USB 3.1 Gen2 (10Gbps) card. 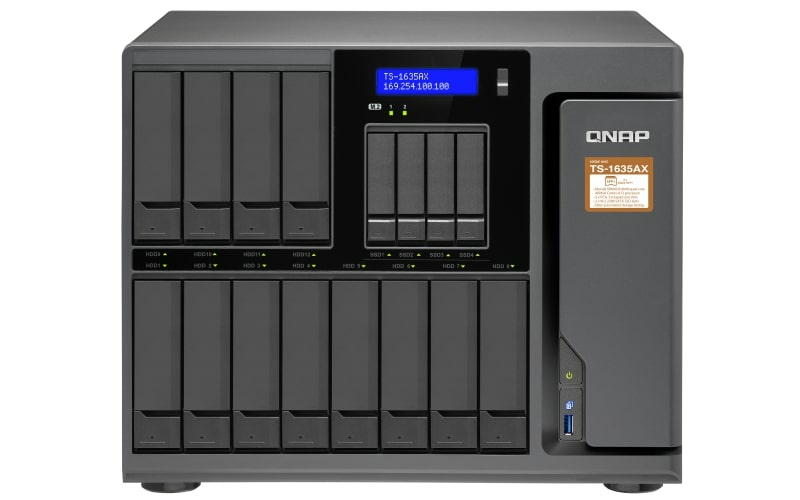 The TS-1635AX offers high-capacity storage potential, high processing power, and high versatility for expansion, which all contribute to a next-gen storage system at a lowered total cost of ownership (TCO).